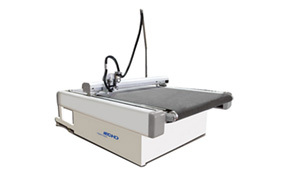 The SC high speed, large format, automatic cutting system is a single, or low-ply, static table cutting system designed to cut a wide variety of special materials and industrial fabric with high precision, speed, credibility, and intelligence. 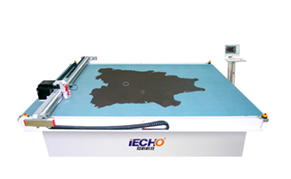 The SC cutting system is easy to operate; it can cut carbon fiber, glass fiber, PVC, leather, and other soft composite materials automatically with high speed. All of this is done by inputting the patterns, without having to make cutting dies. This system is equipped with five cutting tools that can be changed quickly. With the ECHO powerful automatic nesting system to reduce the space between patterns, it allows you to improve the material utilization and save costs. 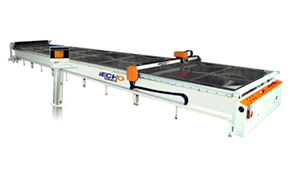 High Speed: The cutting speed is fast without cutting cardboard sample, which can reduce manual operation, improve production efficiency greatly. Precision: Incomparable cutting quality, high repeat ability and cutting precision. Tools: The system is equipped with variety of cutting tools and pens, which can be quickly interchangeable, and cut many different materials within a variety of industries. We can help select the suitable configuration according to your requirements. 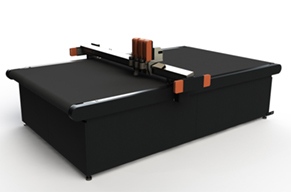 This machine can identify the international standard HPGL or DXF file formats which are compatible with any CAD system. Quality acceptance, ISO 9001/CE (European Security Certificate), etc.